Invasive Alien Plants (IAPs) are widely considered as a major threat to biodiversity, human livehoods and economic development. IAPs cost South Africa tens of billions of rand annually in lost agricultural productivity and resources spent on management. On 1 August 2014, the Minister of Environmental Affairs published the Alien and Invasive Species Regulations (“the Regulations”) which came into effect on the 1st of October 2014 in a bid to curb the negative effects of IAPs. The Regulations call on land owners and sellers of land alike to assist the Department of Environmental Affairs to conserve our indigenous fauna and flora and to foster sustainable use of our land. Non-adherence to the Regulations by a land owner or a seller of land can result in a criminal offence punishable by a fine of up to R5 million (R10 million in case of a second offence) and / or a period of imprisonment of up to 10 years. Can Water Rights Be Transferred? What Do Our Courts Say? The estate agent marketed your property well, a willing purchaser was identified, and a contract signed and sent to the attorneys who are now only awaiting approval of the bond by the bank to continue with the transfer. So when must you pay the estate agent his commission? 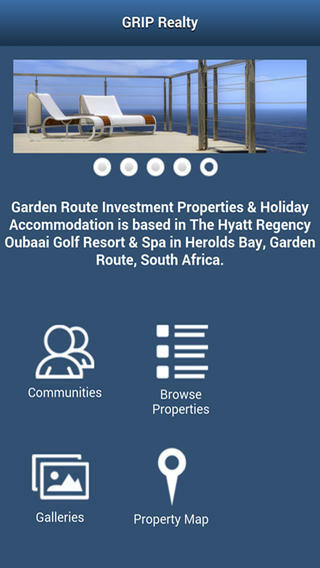 Grip Realty, a leading development real estate marketing estate agency in the Garden Route, South Africa has announced the launch of their Mobile APP. In doing so they have become the first estate agency in the Garden Route to produce an APP that is capable of being viewed on Smart Phones and Tablets running Android and Apple iOS.